Absoluut was born in 2003. Twelve years, 215 gin tonics and 643 birthday cakes later, we still pour our heart and soul into our campaigns, day after day. We are proud of every single one of them. But we are sure that these absolute classics will have caught your eye over the years. In 2011, not everyone was convinced that tap water was a good alternative to bottled water. The SVW wanted to change this with a traditional brochure. But Absoluut thought there was a way to do things bigger and better. It was also the first year that the Music for Life charity week was organised. The theme? Clean drinking water. So we made a deal with Flemish radio broadcaster StuBru, which organised Music for Life. 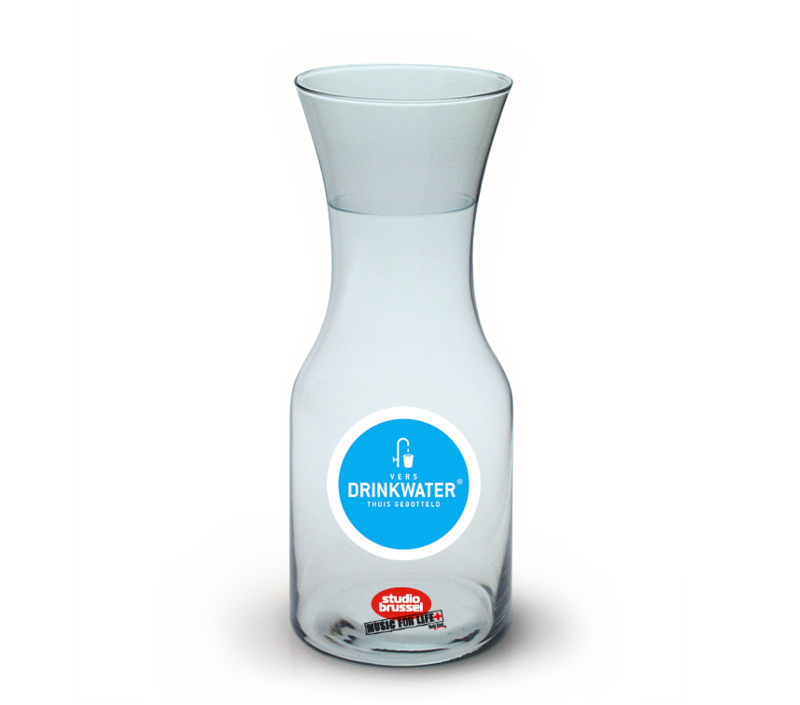 We created water pitchers, selling them throughout the country for charity. The image of tap water was hugely boosted as a result. Music for Life received a fat check. Combined with a TV ad and a campaign site, this approach generated more media attention for the SWV than they’d ever hoped for in their wildest dreams. “Save up for a bike bag”? OR “Save up for the one and only bike bag by Walter Van Beirendonck”. “We can’t afford this,” they said at the BBL. “Yes, you can, if you go about it the right way,” we replied. And Walter did it… And it became a real must-have gadget. 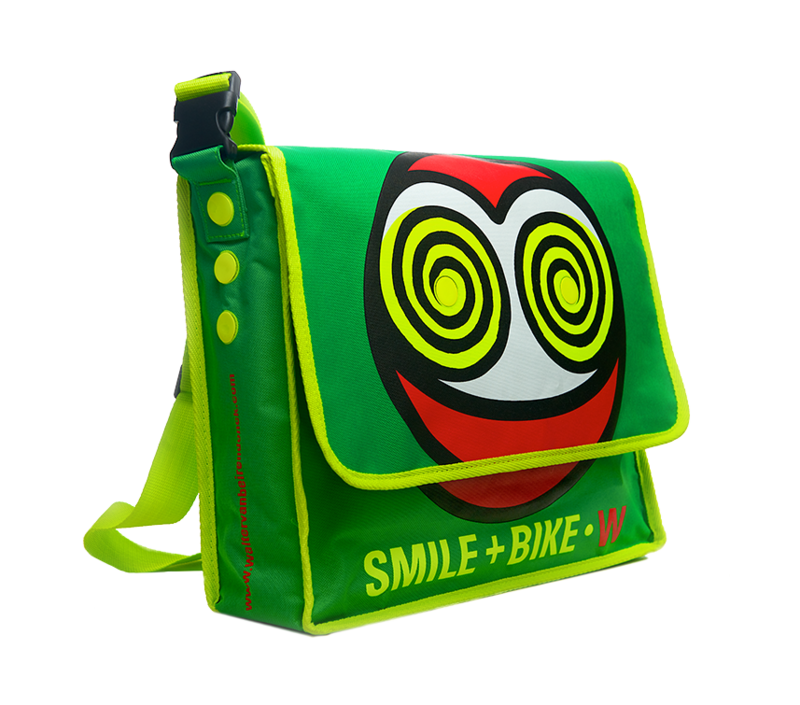 In fact, a whopping 65,000 cyclists saved up for the bag, under the slogan “Fiets je hip” (Cycle chic). More people participated in “Met Belgerinkel naar de Winkel” than all the previous years combined. And even now, you’ll still see one whiz by now and then. Always play it safe? Sometimes this has just the opposite effect. Take antibiotics. They are just as useless for treating the flu or a common cold, as say, wearing swim floats all day long. By the time you really need to start swimming, they will be deflated. So swim floats became the symbol of our campaign, for both the TV ad and the poster. We put swim floats on a series of famous statues throughout the country. Katja Retsin wore them while presenting the showbiz programme “De Rode Loper”. And the Ketnet wrappers also got on the bandwagon. In fact, the campaign generated so much (free) publicity that Europe adopted it too. Economic crisis. Bankruptcies. Job cuts. In 2011, our economy was faltering. The trade unions planned massive demonstrations to protest against what was going on. But UNIZO – which represents entrepreneurs – did not agree with this. A strike is not a solution. 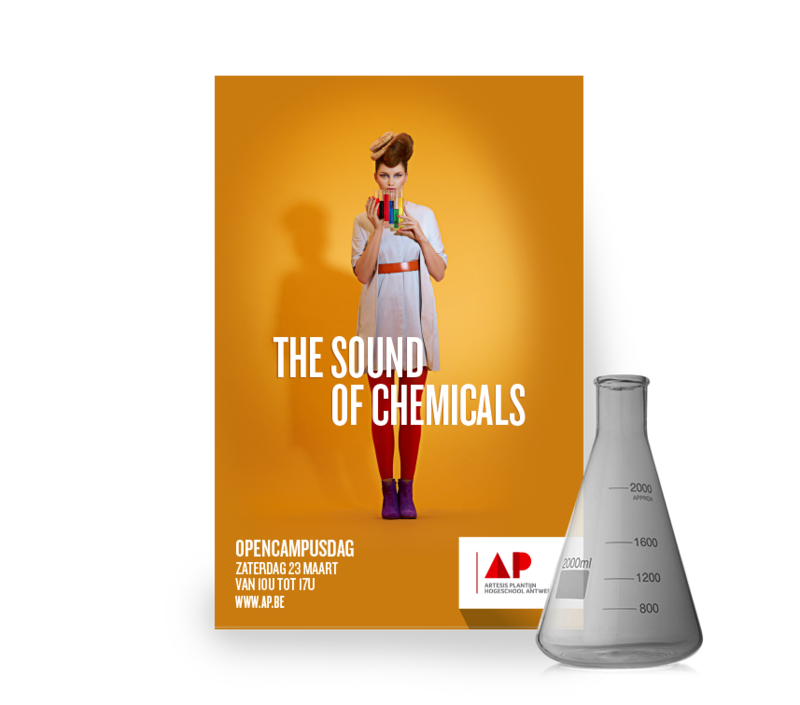 Together with Absoluut, UNIZO organised the largest ever online anti-demonstration. 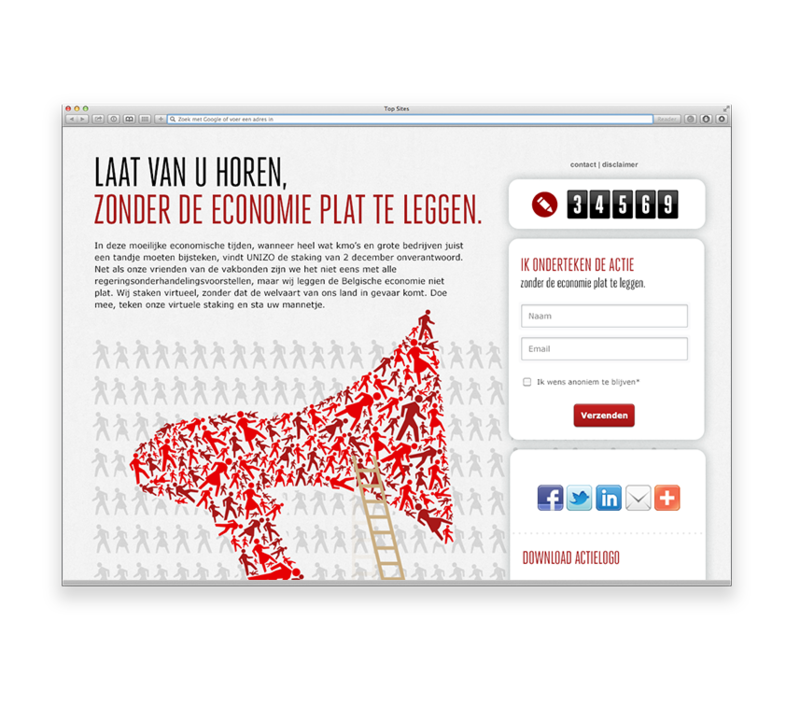 In just a few days’ time, we put together an online petition, titled “Wij staken niet” (We’re not striking), with a positive message posted on social media, which was signed by 60,000 entrepreneurs and employees in just a few hours’ time. Your mobile phone charger, the light on your coffee maker, the laundry machine. They all consume energy unseen. In fact, they consume about €125 a year per household! That’s crazy. Infrax, the network operator, decided something needed to be done. The result was “Ik doe ze uit (I’m switching them off)”. Infrax clients could switch off their own standby light on an online map. The lights concealed fun prizes. Top of the bill? The most energy-friendly concert ever in the world by Stijn Meuris, completely acoustic, with all the spotlights dimmed. And what an intimate concert it was! 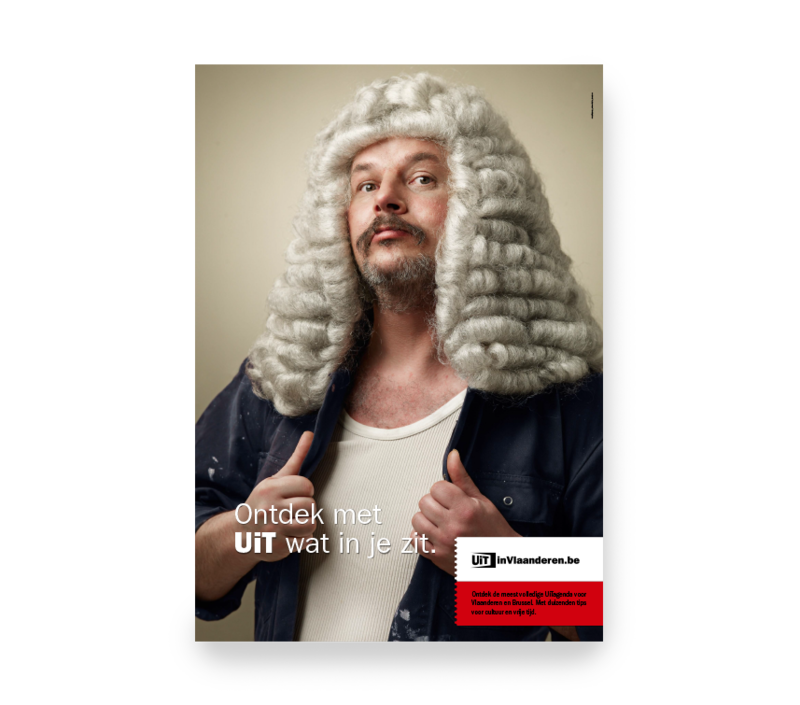 Every year, the newspaper De Standaard awards a prize for the best advertisement in the non-profit sector. The winner receives free ad space in the paper, which is a welcome bonus for these organisations because they can use all the help and support they can get. 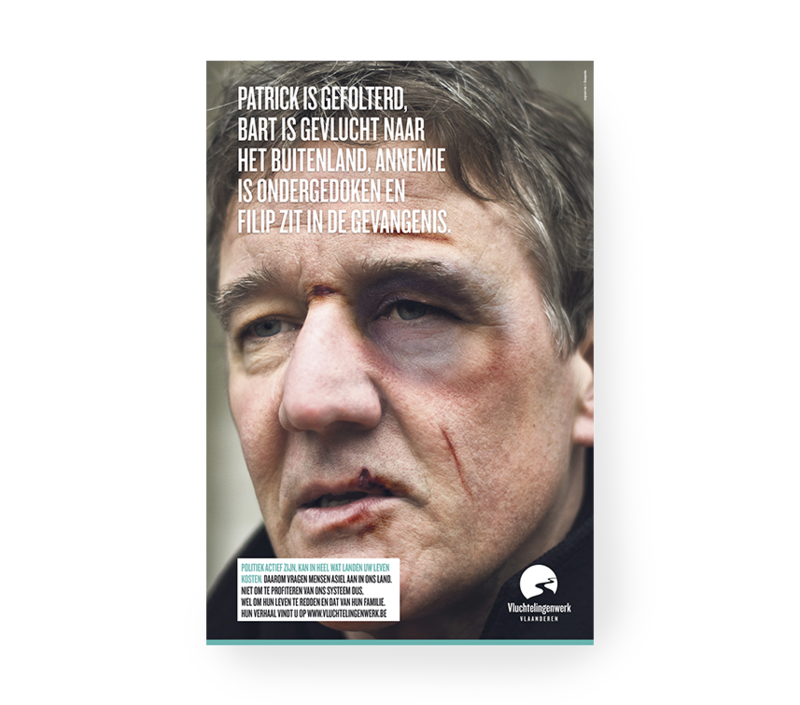 In 2012, we convinced the jury with our Patrick Janssens ad. (Ed. : Patrick Janssens was the mayor of Antwerp). The message? Engaging in active politics can be quite dangerous in some countries. 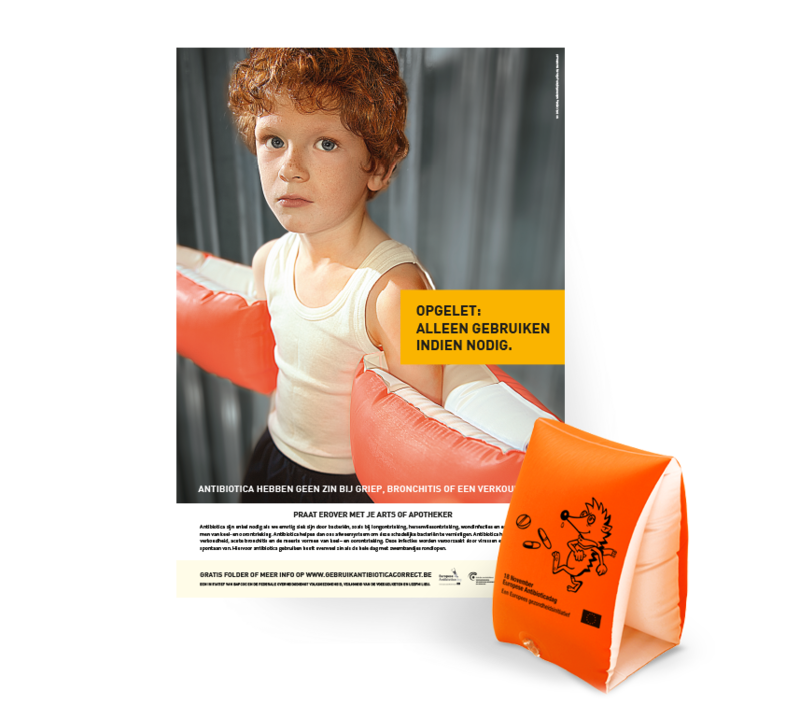 The fact that the ad was published in an era that two politicians, namely Patrick Janssens and Bart De Wever, were engaged in a furious battle for the post of Mayor of Antwerp, added that extra touch. Major changes in education. Artesis and Plantijn, two university colleges that were based in Antwerp, decided that they would have much more clout if they joined forces and became the biggest university college in the city. Not an easy undertaking because each college was organised in its own way and had its own customs. And its own communication style, of course. Absoluut assisted wherever possible. You guessed it; we created a new corporate style, as well as an entire campaign to celebrate the launch. We used it to tell everyone in Antwerp and far beyond that there was a new kid on the block. And what a kid too. In 2003, the Belgian government decided that the three oldest nuclear plants in Belgium would be closed down in 2015. Behind the scenes, however, the lobbyists of the nuclear industry were working hard to have this closure postponed for another 10 years. Time for Greenpeace to step up its game. “If they can play it the hard way, so can we,” the Absoluut team thought. 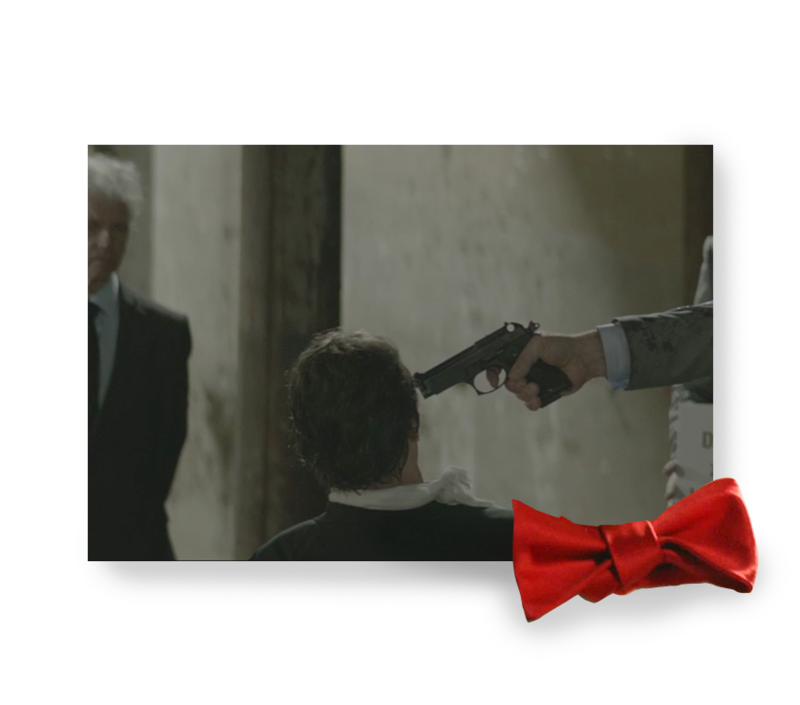 So we came up with a tough-as-nails ad, for a minimal budget, in which the nuclear lobby exerts pressure on Prime Minister di Rupo, even going as far as torturing him. In no time at all, the ad became a very hot topic and was picked up by the media, constituting a tipping point in the debate and public opinion. Cultuurweb.be, the online calendar that lists every cultural activity. A fantastic initiative. Except that nobody even knew this website existed in 2011. Absoluut to the rescue! We thought about the website’s positioning, image, marketing strategy and corporate style. We also came up with a new name. We developed the well-known “UiT” (Out and about) label for Cultuurnet and cultuurweb.be was renamed uitinvlaanderen.be. 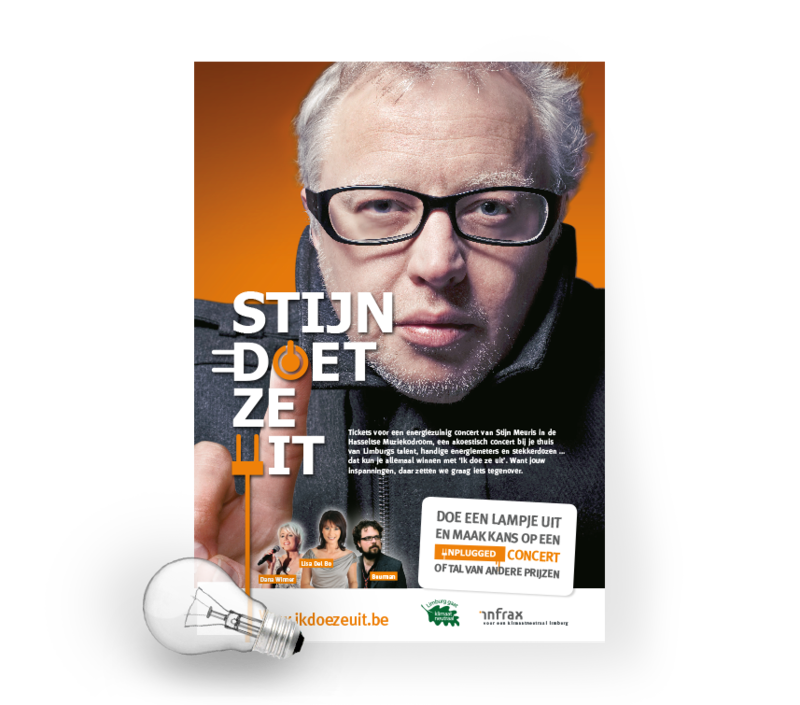 Thanks to the image campaign, “Ontdek met UiT wat in je zit” (Find out what you are capable of with UiT), Cultuurnet became a strong brand. Something we are still very proud of! Absolutely convinced? Then let’s meet! Curious about life in our tower?